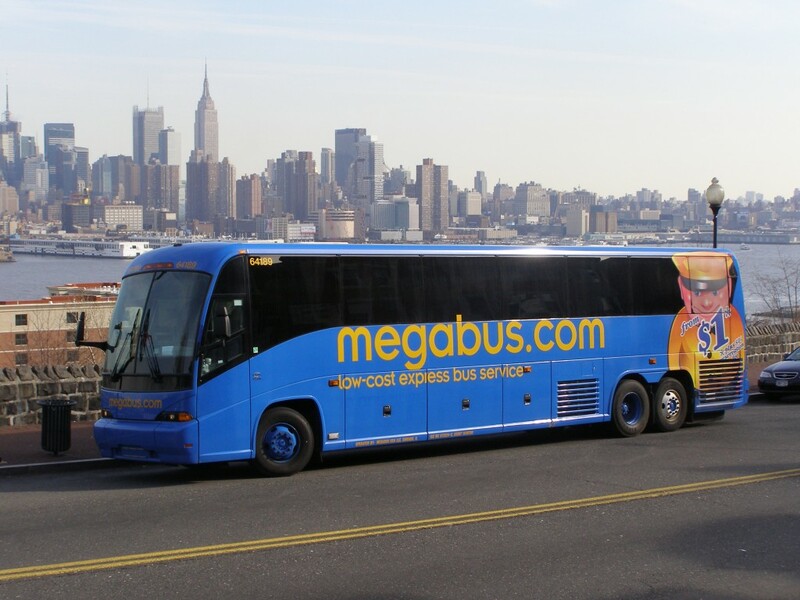 A double-decker Megabus in NYC. The bus line doesn’t have stations. Passengers catch the bus on street corners or in Atlanta, at the Civic Center MARTA station. At this point people show mild interest. “And,” I say. “Our fare for two people round trip to Nashville is $16.” Now, I’ve got their attention. With gas prices these days, $16 worth of gas barely gets you beyond the perimeter. At my suggestion, my husband took Megabus to Charlotte a few weeks ago. After boarding the bus, he sat down, opened his laptop and began working. Before he knew it, the non-stop bus was there. He saved wear and tear on his car, money that would have been spent on gas and got eight hours of work done by the time he returned. My inaugural Megabus trip was last weekend. We scouted out a parking space close to the MARTA Civic Center Station where the bus departs from and checked in with a nice lady taking reservation numbers. We handed over our luggage to Lewis, our friendly driver, and hopped on board. We opted to climb up to the top deck where we settled into our comfortable seats. A few minutes later we were off. Lewis came on the speaker and introduced himself as our motor coach technician, and promised he would take care of us like his own family. I relaxed, got out my iPad and began watching a movie on Netflix. After one brief stop in Chattanooga, we arrived in downtown Nashville that afternoon, relaxed and refreshed. I would definitely ride Megabus again and am recommending it to everyone. Here are a few tips for you newbies.
. The earlier you book, the cheaper the fare. I booked our trip to Nashville about five weeks out and got the $8 round trip fare. I just checked the site and if I booked today to leave tomorrow the round trip fare is $40. Still not bad. But if you think you’ll be taking it, go ahead and book. If you do have to make a change to your trip, the fee is $1. Way better than the $150 the airlines charge.
. There is no food or drink for sale on the bus but you are welcome to take your own. We packed a lunch and I made sure to take plenty of water.
. There is a bathroom but it’s cramped and doesn’t have a sink. There is sanitizer in there but I suggest you take hand wipes with you. On the way up we stopped in Chattanooga in a mostly deserted shopping center. But we spotted a Starbucks and hoofed it over there for tea and a restroom break.
. On our trip up, the bus was less than a quarter full and no one was sitting close to us. On the way back, however, the bus was full. A few people play their music so loud you can hear it despite the fact they are wearing headphones – very annoying. Next time I’ll take my own noise-canceling ones. You mentioned that you scouted parking around the MARTA Civic Center. I was wondering where did you find to park. I will be traveling the same route from Atlanta to Nashville on Megabus and wondered where a friend can park so that I can unload my luggage and he can wait with me. Your friend doesn’t have to park. There is plenty of space right by the train station where he can pull up and wait for you.